If you may indulge me on a juvenile analogy: If Japanese shabu shabu was Super Mario Brothers; then Mongolian hot pot would have to be Worlds of Warcraft (apologies to anyone reading who isn’t a nerd). Hear me out: In shabu shabu as in Super Mario, you start with a single character—plain water for the shabu shabu cooking broth, Mario for the game. By contrast, in Worlds of Warcraft as in Mongolian hot pot, you begin with a myriad of options. WoW lets you start out by choosing a character from a range of classes, whether it be a warrior, mage, hunter, etc. In Mongolian hot pot, you choose your starter soups, whether it’s the spicy fish slicked with enough chili oil to burn a hole through your esophagus; a not-as-spicy tomato fish brew; a spicy chicken soup; a duck broth made drunken with beer; or even a mushroom soup. 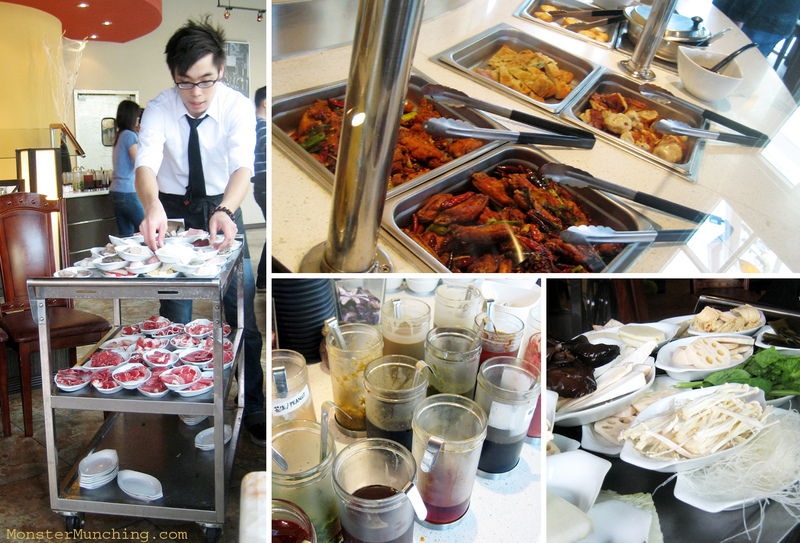 From there Mongolian hot pot, like the popular MMORPG, can be whatever you want it to be. It can veer into territories unknown. Your eating adventure is whatever you make of it. 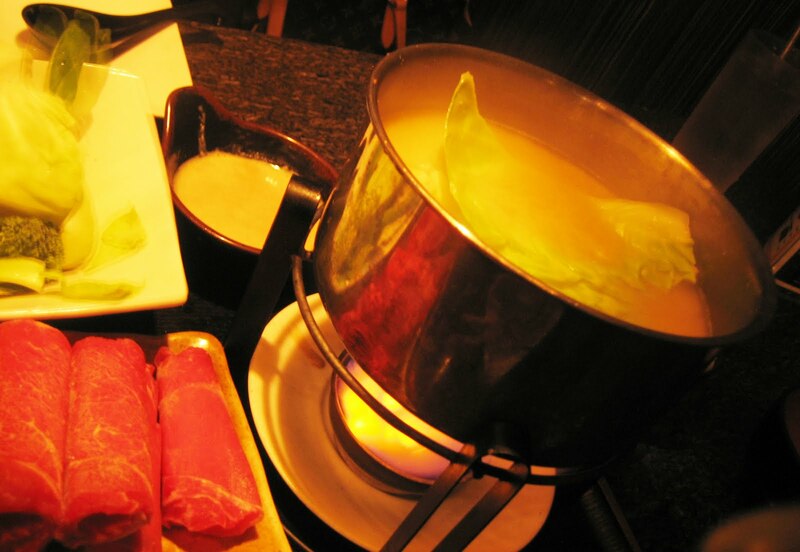 In every bite of Mongolian hot pot, as in every WoW quest, you will encounter textures and flavors of your choosing. Therefore, whatever you’re putting in your mouth will most likely be unique to you, different from what the next guy is experiencing. At Flaming Spice in the City of Industry, not only do they have these varied options of boldly-flavored soup, every yin of that is paired with a yang that balances it. That is the function of a murky, milky broth that the restaurant supplies on the other side of the pot. You’ll need it because sometimes, actually, most times, the flavored soups are too intense to handle without the milder one there as a reprieve. I chose the spicy fish and the first dip of meat I ate from it caused ripples of sweat to stream from my brow. In fact, whatever it was that I rescued from this demon broth with my chopsticks came out coated in thin film of red chili oil, like something fished out of the waters after the Exxon Valdez. I’m convinced that if the liquid completely evaporated, whatever solid matter that remained in the pot would effectively get shallow fried in the oil left behind. One thing is certain: Those who complain that Japanese shabu shabu is bland would be summarily silenced here. 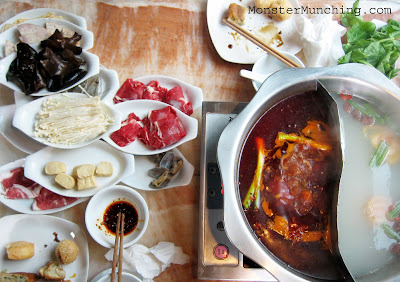 Upon eating this Mongolian hot pot, someone like that would also become a convert. There’s an excess of flavor of the throat-burning, how-have-I-lived-without-this, and hurts-so-good variety. And when you consider that there's a counter of sauces to mix and match, there is actually a danger of thoroughly exhausting your already overwhelmed taste buds. And if I may be allowed to continue the video game analogy for a moment longer: Here at this restaurant, an eating session can be just as never-ending as a game of WoW. For $19.99, you can continue picking up items, dipping, swishing, slurping until you’re just as over-stimulated like too many online gamers I know. 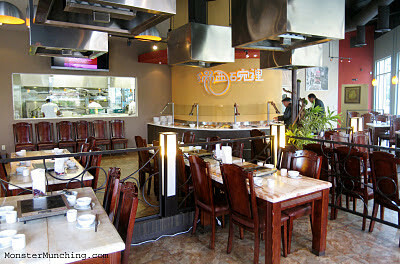 There are other all-you-can-eat Mongolian hot pots restaurants around. I wrote about a place called Red Pot in Garden Grove once. But Flaming Spice is different. At the former, there’s paper work when you require more meat. At Flaming Spice, the proteins are carted around dim-sum style. Nothing more than a whim allows you to pick up more sliced raw beef than you can possibly melt in the broth; more head-on shrimp than you can possibly peel; more clams than you can possibly scrape off with your two front teeth; more fatty lamb than you can possibly boil; more meatballs than you can possibly chew. Then there are the vegetables, like the meaty king mushroom, the tofu (fried, firm or silken), the taro, and the greens, all of which soften to scalding mouthfuls that you eat in between the scalding mouthfuls of meat. 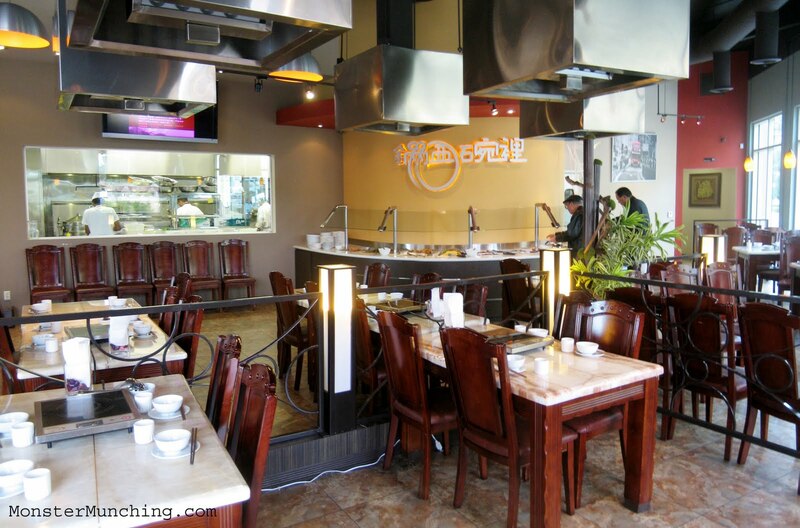 And if someone in your party still complains that they're essentially paying a fee to cook their own meals, Flaming Spice has a small buffet with some notably well-made items like wontons in chili oil; thin slices of spicy, ruddy beef; and chicken wings that are as equally hot as everything else. Sesame balls, fried bread, egg custard, and pan-fried dumplings round out the offerings. Like Worlds of Warcraft, however, there are a few minor bugs in the code: the dumplings can be a bit greasy, the catfish in the spicy fish broth is frustratingly characteristic of the bottom dweller (read: muddy); and every other slice of lamb can be a chore to chew. But overall, my meal was good, and with this trip, my spicy food experience went up at least three levels. 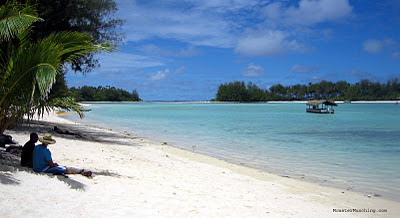 When I told people that I just came back from Rarotonga, they'd ask "Where?" When I told them it's in the Cook Islands, they'd ask "Where?". Frankly, before I went, I too had no idea. All I knew before I booked the flight was that it costs just as much to go there as it would Hawaii. Rarotonga is the main island in the Cooks, a round-shaped land mass in the South Pacific with strange-looking mountain peaks in the center. If you look at it on Google, you'll notice that it is rimmed by a halo ring of reefs which has the distinction of turning most of the beaches into calm-watered lagoons. This meant that anywhere you dipped your toe is a good place for snorkeling. Most hotels, including mine, offered free rentals on the equipment. Most tourists come to wile away the hot, humid days with their faces submerged under the crystal blue water to get acquainted with Nemo and his pals. I didn't go more than a few steps from shore to be surrounded by schools upon schools of fish, some of which looked very delicious. Which brings me to the food of the Cooks. 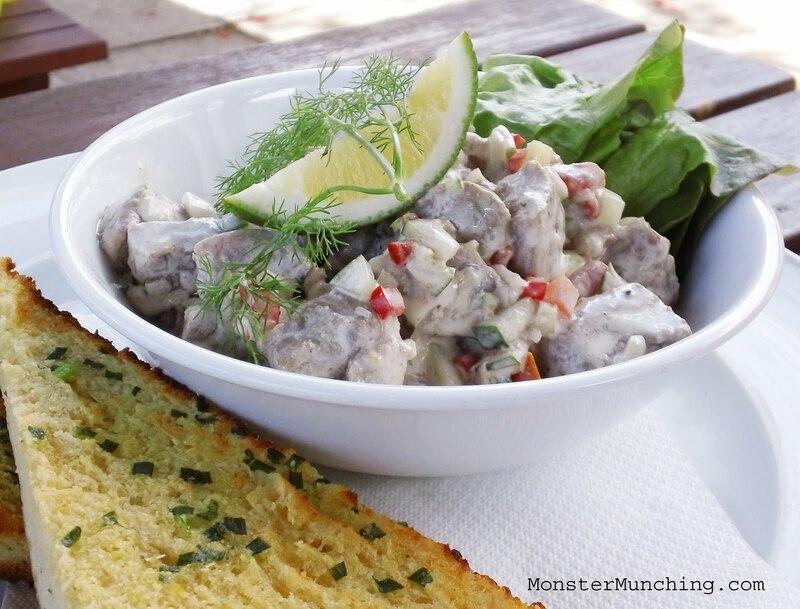 There are very few indigenous dishes offered at the island's eateries. 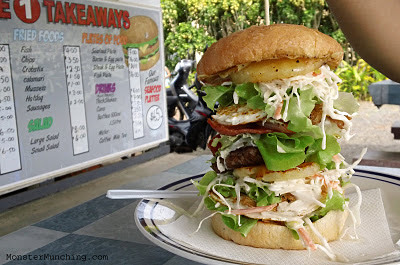 The most popular place in the town of Avarua is a burger joint called Palace Takeaway. The cheapest burger retailed for about $5 in New Zealand dollars...and this is as good a bargain as it gets in Raro. Since practically everything is imported from New Zealand and Australia, prices are inflated to factor in shipping costs. The signature sandwich at Palace costs $10, and it towers so high it must be secured from toppling by way of a bamboo skewer driven through the middle. In the stack, the coleslaw, local lettuce, two fried eggs, bacon, pineapple, and ground beef patty must be smashed and pressed down if you ever hope to get your mouth around it. There is one dish distinctive of the Cooks more than any other. Called ika mata, it's a cross between ceviche and poke. Like ceviche it is pieces of fish cooked by the cold, acidic heat of lime. Like poke it exists in cubes. But ika mata is its own thing. It is tossed in coconut cream to make it unique to this place, and it eats like a distillation of the land and sea. Diced cucumber, onion and red peppers dot the dish and the best place I found to eat it is at an inexplicably named Cafe Salsa, which served pizza and salads. Island Nights, which is the Rarotongan equivalent of the Hawaiian luau, will feature ika mata as its central dish, but it was never as good as the one Cafe Salsa made. Hmm, I wonder if the people at Cafe Salsa have ever heard of Taco Bell. Sanukiseimen Mugimaru ain't messing around with their udon. They treat their noodles with the care of a mother bathing an infant. This is appropriate as the precious strands are born right there, in the narrow kitchen within view of anyone who cares to peek in at their stall in the Mitsuwa Marketplace food court. I've not been patient enough to witness the entire process take place, but I can imagine it could take hours to make proper udon. And if there's anyone obsessed enough with creating an optimally chewy udon noodle, it's these guys. With nets, vats, steaming hot vessels, and ice cold baths, what happens down the line is done as a hallowed ritual here--a far cry from those vacuum-packed squares we're all used to. Barely anything is done to the noodles when it's served to you. It can be had hot or cold. Ask for hot, whether it is with a broth, some curry, or a concentrated kind of sauce, and a worker will temper an empty bowl, dipping it in hot water and turning it until it comes to temperature and thus, ready to receive the noodles. The udon is then dropped in with nothing more than the basic components required. Add ons of green onions, tempura crumbs, and red pepper are your duty to apply. My favorite way to take the udon is in a soup with one of those silken eggs that's cooked low and slow until the yolk and albumen take on the same homogenous consistency somewhere between liquid and solid. Cracked and released into the broth where it floats as if in a lava lamp, it is almost as good as the noodles. 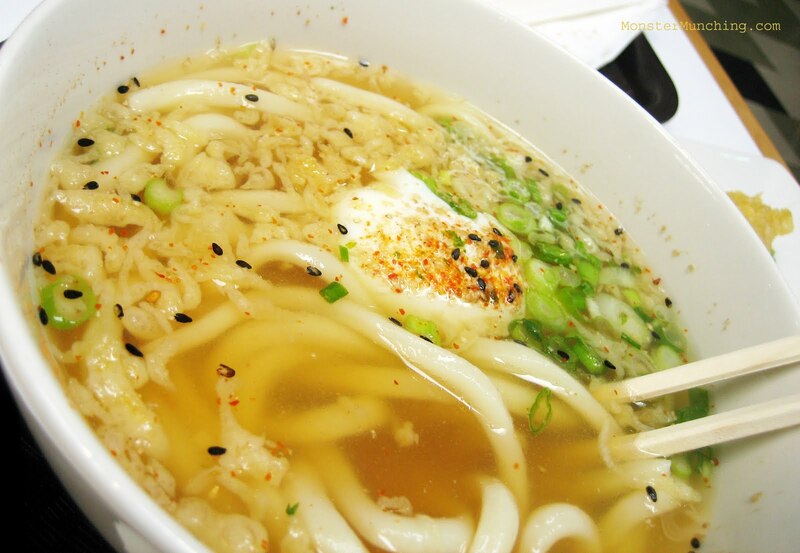 Udon, famous for its thick and toothsome chew, is especially bouncy, slippery, elastic here. 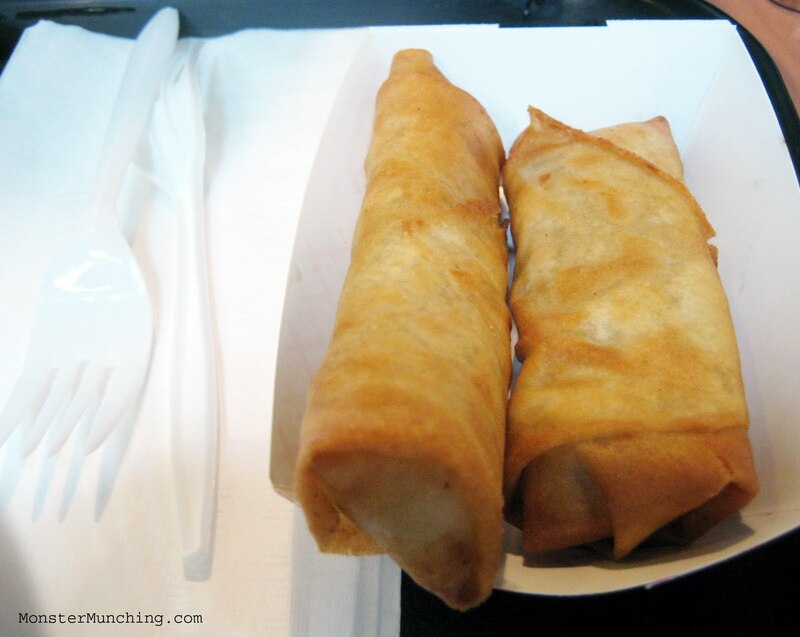 The natural foil to them is tempura, which exists in a pick-your-choice, pay-by-the-piece bar near the cashier. 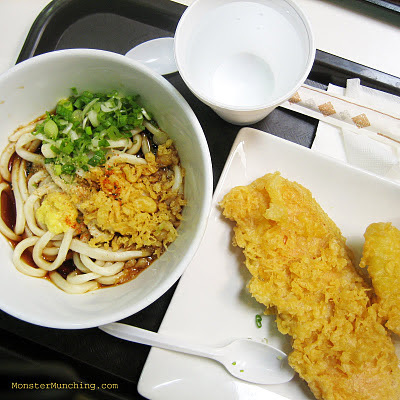 But despite all the reverence, however you eat the tempura with the udon, whether you decide to dunk it daintily in the liquid, submerge it completely in the soup, or munch on it like a side dish, there is no wrong way. Slurping, by the way, is completely acceptable. When Balcony Grill & Bar first opened at Diamond Jamboree, it was eviscerated online. For one reason or another, no one seemed to like it much. But as the years passed, it somehow got in good with the cool kids. Before long it became a kind of a sleeper hit, winning loyalist and gaining a cult following. I’ve actually eaten there more than I have at Tokyo Table, more than Capital Seafood, and yes even more than 85°C. And it’s not because I was necessarily rooting for the underdog. Their Happy Hour was decent with alcohol-appropriate bites they called “Drunk Munchies”, and their snow ice was unique to the area; but most of all, I went for their shabu shabu, which exists in at least a dozen different permutations, with flavored broths from ranging from a basic miso to a kimchi-inflected soup to something that I recall used either milk or cheese. The meat was frozen into hair-curler tubes, stacked like logs and stored that way until someone ordered it. And almost everybody that came to Balcony did. 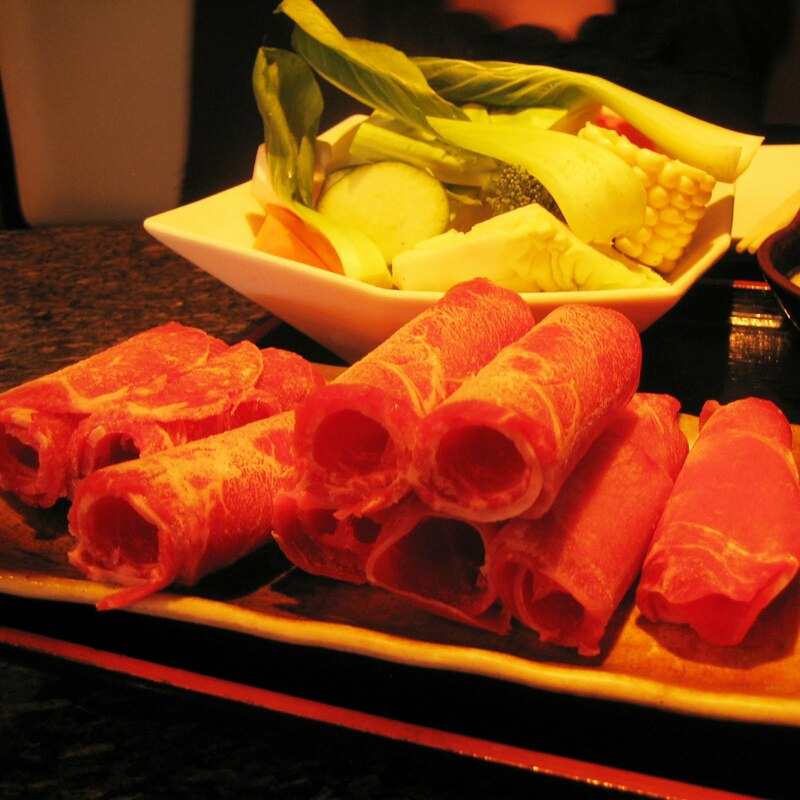 It didn’t matter that it wasn’t sliced to order the way a proper shabu shabu restaurant would. The rib-eye reacted in the same way in the boiling liquid: it melted into tenderness. The veggies were basic. Cabbage. Baby bok choy. Carrots. And the cooking vessel was nothing more than a campfire pot heated by Sterno gel that sputtered blue flame. But I loved it. It was priced right (somewhere in the ballpark of $13) and it satisfied me more than meals I’ve had at some shabu shabus, places where I’m liable to pay almost twice the price. And then, there’s the element of danger. Here, you’re really playing with fire, not an induction heater. I heard from fellow forker Brekkie Fan that Balcony Grill & Bar was recently taken over by new ownership, and I hope they read this and resist changing their shabu shabu offering. There’s increased competition now with SWSH, an actual shabu shabu restaurant that opened right next door; but I hope they’re wise enough to leave well enough alone. Let Netflix be the cautionary tale. Stick with your pricing model and do not alienate your cult! Pad Thai is a fine dish. But to me the Thai noodle to eat is pad see ew. In my humble opinion, it is the truest expression of a stir fried noodle as any. Forget about chow mein or even chow fun. 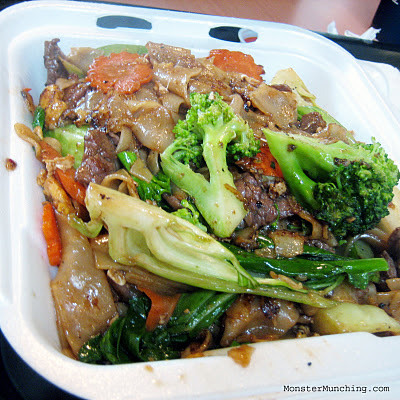 The components of a pad see ew is dead simple: sweet soy sauce, beef, some sort of green vegetable but preferably something with a crisp stalk like broccoli, and then rice noodle ribbons rendered to silk. Pad see ew should have just the slightest chew, a little sticky, a little tacky; but it needs to ultimately slide into your gullet as if it were lubricated in KY jelly. Everything else is execution and depends on the talents of the wok jockey charged to make your dish. There was once a food court vendor called Zesty Thai in the now defunct Palm Court Cafe in Irvine that used to do a pad see ew of unequaled splendor--a masterpiece that bested even Buena Park's Thai Nakorn and Vegas's Lotus of Siam--but they've been gone for years now. Now I think I've found a close enough replacement. Like Zesty Thai, Thai & Chinese Express is a food court denizen, and it prepares its pad see ew to order. Eaten seconds from the blazing heat of the wok, the noodles have that wok-seared flavor and soul that lasts only a few fleeting minutes. Plus, it's also got the most vegetables I've seen in a pad see ew, which isn't a bad thing--I could always use more vegetables...especially when I order the fried bananas for dessert, a banana deep fried in egg roll skin, which is all it needs to be.